We're going through a bit of a trial and error period around here. On the advice of a well-trusted friend (who is a cat breeder), we made the decision to switch our cat's over to healthier food from "checkerboard brand" they've been getting up until now. Full of corn fillers and other not-so-good stuff, the food was causing frequent tummy, skin, and fur problems for our sweet kitties. So it was off to Pet Food Express with recommendations in hand. We knew we were in for an interesting experience trying to find a food that our finicky crew will eat. All of them but Lucy, will walk away from turkey giblets and chicken or meat scraps. But if I sit down with tortilla chips or Triscuits I've got a couple of them begging for some. Weird. Fortunately, Pet Food Express has a return policy for food if your pet doesn't like it. We were assured that we could bring back an empty can and get refunded if our kitties didn't like it. If they didn't like the dry food, then we could bring back the uneaten portion in the bag. Hey, this trial and error phase wouldn't be quite as painful to the pocketbook as we originally thought. We were relieved. So we came home Monday with a number of dry and canned options (we're going to feed them a combination of both everyday). Things went smoothly at first with the dry food. Except one brand had little round kibbles that kept falling out of the kitties' mouths when they tried to eat it. That one is out. The other dry food is one that they seem to like. And the tummy issues have diminished dramatically since the switch. So that's a good sign. The canned food is a bit more problematic. They liked the chicken mix I gave them on Monday and Tuesday. On Wednesday, the kitties weren't too thrilled about the chicken and lobster mix I gave them. But they tried it and ate a bit before heading off for kitty bathing sessions and a nap. They also nibbled a bit at the salmon and trout mix I gave them later, but it was clearly not their liking. Then came today when I apparently committed a major no-no--I tried to add fish oil to each bowl as suggested by my friend. I broke open a capsule of omega-3 fish oil into the bottom of each bowl, and then put a helping of a chicken mix they've heartily eaten earlier in the week. Well, these kitties wouldn't have anything to do with that! I put down the bowls and they ALL literally turned up their noses and sat in dismay looking at me as if to say, "Um, excuse me? You expect me to eat something that smells like that?" Thomasina finally stuck her nose into one of the bowls and licked a bit, but not much. Not even our "Lunch Mouth" Lucy wouldn't touch the stuff. So now I've got 8 tiny bowls of practically untouched food that will go out to the Oreo the garden kitty (and Mooch the neighbor's cat) later this evening. Hopefully, she'll eat it with Mooch's help. I must have the weirdest cats on the planet! I've never heard of a cat who didn't like fish, hmmmm...lol my cat's name is Mooch too. Trixia and Tisha will eat their cat food, but not the cat treats. Who knows what a cat thinks. 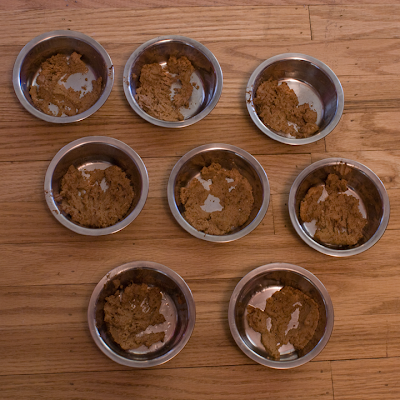 My cats are weird...they will NOT eat wet food at all....only dry. Sometimes when I open a can of tuna I will drain the liquid into a bowl and give that to my female (she won't eat the actual tuna)...and my male is a mouser and he supplements with dry food!! Nope, your kitties are quite normal Cindy, well as far as cats go. :-) Try mixing the new tinned food with the old. First 50/50 and then more as they have no problem eating it. Another trick is to add a bit of chicken broth of tunawater not oil (from a can of tuna)to their canned food. I went through the food trials with my cats too, especially when my youngest was suffering with pancreatic insufficiency. I think he would have died of it had I not found a web site that talked about raw food diets for cats. I switched both cats to minced raw chicken and it immediately solved the PI problem. I kept the cats on it for several months and they both did really well. The idea is to give them some version of what they would eat in the wild--raw birds and rodents. They seemed to tire of the raw chicken eventually and since then I keep them on Science Diet food, but to tell the truth I believe the chicken was a healthier diet for them. (Kind of icky for me though!) Good luck! That photo must be one of the funniest I've seen in a long time! Eight, EIGHT!, empty CAT dishes! It mut be a record, Cindy. My rule of thumb for pet food has always been that real whole meat has to be the first ingredient. It's actually really hard to find, even among the expensive brands! It ends up with an added bonus, though - less poo, and it doesn't smeel as strong. Dama Dog has always had really bad skin problems so that's why we had to experiment with food. As for fish - Jolie Cat will ONLY eat fish. Chicken? Ew. Beef? you must be joking. Bring on the salmon, tuna and cod fish, baby!! Her food preference right now has salmon as the first ingredient, guaranteed to never be snubbed! !